CCCA camps and conference centers are busy places, and leaders often have plenty on their plates. Sometimes, safety concerns can end up out of sight and out of mind. Other times, the concept of safety in camps and conference centers can seem overwhelming. However, safety is largely a product of common sense. Keeping safety simple is the easiest approach to providing a secure environment for your organization. Identification and elimination of the basic common hazards is the first step in increasing the level of safety awareness. As a very simple example, fire safety can be viewed as keeping what is hot away from what will burn, and getting away if something does burn. A lot of common hazards can be corrected simply and by taking the time to properly evaluate your facility. Forming a safety committee and setting aside a few hours every month to review your facilities and safety plans is a great way to enhance the overall level of safety and preparedness at your camp and conference center. Use our Self-Inspection Safety Checklist for key things to look for. Slip and fall injuries are common occurrences that are easily preventable. Check for trip and fall hazards such as equipment cords stretched across walkways, wrinkled rugs, loose carpet and cracked or missing floor tiles to help reduce trip and fall related incidents. Evaluate stairways for properly secured handrails, slip-resistant steps and adequate lighting as another means to reducing injuries. Also, make sure all emergency exits are clearly marked, well-lit and kept free of obstructions when buildings are occupied. When evaluating your facility, we recommend you identify and document your findings. Next, determine and document an action plan for each hazard noted. Prioritize your action items based on the likelihood of the hazard causing an injury or damage as well as the severity of the injury or damage that may occur. Take action as soon as possible and update your records accordingly. Safety at camp is in the best interest of everyone; campers, staff, and the organization all benefit from a safe camp environment. By taking time to recognize and correct hazards, you can ensure your campers and staff go home safe and happy and your organization continues with your operations. We're here to help! 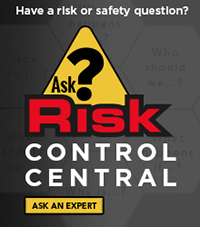 For additional questions, contact Church Mutual Insurance Company's Risk Control Central.